When Drew Cook got his first job as a teenager, his grandfather made him a deal. For every dollar he put into a retirement account, his grandfather would match it. 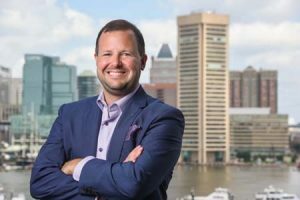 Cook has spent his entire career at the Lutherville-Timonium-based Berman McAleer starting as an intern and rising through the financial planning institution to be named the firm’s youngest partner in its history. Since 2016, he has served as director of investment management. Because the financial world is constantly evolving, adapting and changing, Cook finds the most rewarding part of his job being able to explain complex matters to clients and have them leave knowing he is looking out for their best interests. Cook notes there is a consistent theme when it comes to his volunteer work — education. For 15 years, he volunteered with the Hannah More Foundation serving as a board member and treasurer. Last school year, he volunteered bi-weekly at his alma mater, Loyola Blakefield High School, helping an economics class compete in the national Stock Market Game, a nonprofit which helps students to better understand the stock market and how to invest to achieve their financial goals. “If you can get in (to mentor the) young, you can truly make a difference in guiding them on a path that hopefully will help them out tremendously,” he said.